All for one and one for all – the well-recognisable motto of the main characters created by Alexandre Dumas, writer of The Three Musketeers. There have been many interpretations of Dumas’ famous novel, from film to musical to comic to even video game. 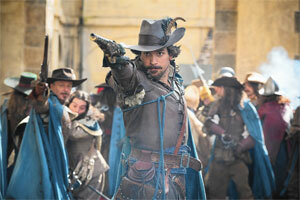 This year, the BBC took on an adaption crafted by Adrian Hodges (one of the creators of Primeval), titled The Musketeers. And it’s amazing. 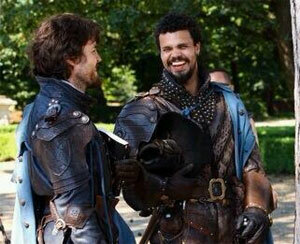 There are so many things that I’m loving about The Musketeers I’m not quite sure where to properly begin. It’s a tale we all know a little, one way or another; the story of Athos (Tom Burke), Porthos (Howard Charles), Aramis (Santiago Cabrera), and D’Artagnan (Luke Pasqualino). 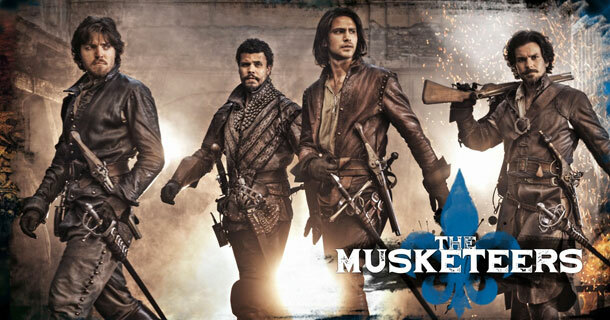 The Musketeers follows their adventures as – funnily enough – musketeers, who are the highly trained guards protecting King and Country in 17th Century France. 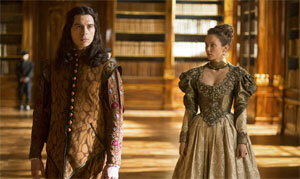 Specifically, King Louis XIII (Ryan Gage) and Queen Anne (Alexandra Dowling). 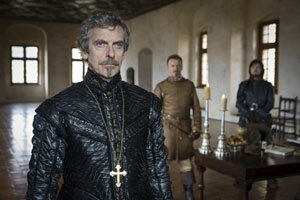 Each episode, while upholding what is honourable and moral and good they’re challenged by the extraordinary to the power-hungry people of court, most notably (and frequently) the Cardinal Armand Richelieu (Peter Capaldi) and Milady de Winter (Maimie McCoy). The story is, initially, D’Artagnan’s. He arrives in Paris in the first episode, enraged and bent on avenging his father, and straight away we’re thrown into the world of sword and musket fighting. It’s one of the things that I love about this show; the choreography. There is lots of action – encounters that feel relevant, realistic and expertly stepped out. But the action doesn’t overtake the plot; doesn’t seem superfluous in any way, and contributes beautifully to the story arc each week. The costumes and props are flawless (but would you expect any less from the BBC?). From each musketeer having pieces of leather armour individual to them while still clearly being part of the musketeers, to Queen Anne and King Louis’ decadent but still believable regalia, to the practical but still feminine dresses of D’Artagnan’s landlady and Musketeer confidant Constance Bonacieux (Tamla Kari). The locations used are gorgeous; filmed mostly in Czech Republic (with the majority of Paris-set scenes taking place in Doksany) and the use of weather adds wonderfully to scenes (My partner’s comment: “When it rains, they actually get wet. Good.”). There is just such a level of subtle detail to The Musketeers. All these little things that you don’t notice in their own right, but as part of the scene and show make for a much richer, truer experience. My favourite thing about The Musketeers, as is usually my favourite thing about any TV show, are the characters. They’ve picked such a diverse and talented group of actors for the recurring characters. The musketeers have this natural chemistry – their camaraderie feels nothing but genuine, as though they’ve been working together and fighting along side one another for years. Each character has their demons of course, which are being explored as the series progresses, in ways that feel very natural to these already well-rounded characters – as in, their backstories aren’t being treated as plot devices. The Cardinal is also pleasantly nuanced – with all the dedicated zeal you’d expect from the series antagonist with so many shades of grey you’re often left wondering if he’s a nasty character, or just a really ambitious one in a position of power who you sometimes, whether you like it or not, find yourself not hating. The Musketeers flew straight under the radar this year for me; I only found out about it well and truly after its first season finished. It’s been commissioned for a second season, which has been filming since April this year, though minus Capaldi, owing to his Doctor Who schedule (Marc Warren is replacing him as the Cardinal in season 2 – should be interesting!). I’m SO glad this wonderfully fun, adventurous drama exists, with its tones reminiscent of other favourite TV shows such as Firefly and the BBC’s Robin Hood (before it, you know, jumped the shark). It’s no mind-bending Orphan Black – but it’s a wonderful character-focussed show with the right mix of action, depth, drama, and fun. So much fun!